The cheek bone or maxilla is hollow. This keeps the bones of the face nice and light. The space inside any face bone is called a sinus.The sinus in the maxilla is sometimes called the antrum and is very large. The bone between the sinus and the inside of the nose is thin like an egg shell. The sinus in the cheek bone has a little drain hole which leads into the upper part of the inside of your nose. Normally the hole lets in air. Infection may drain from the sinus into your nose. This hole often gets blocked if the sinus becomes infected. Sometimes just some swelling of the lining of the nose during a cold will block the hole. 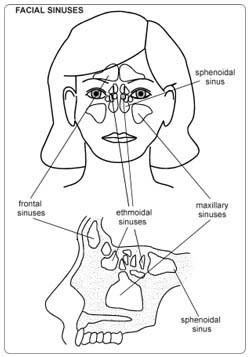 It causes unpleasant pains in the cheekbones and sometimes upper toothache - "sinus trouble". Usually antibiotics and sprays will control the infection and let the hole unblock itself. In your case, you keep having blockages despite this treatment. Your sinus needs to be washed out to get rid of the infection. This should give the tissues a chance to heal properly. You will have a general anaesthetic and be completely asleep. A fine metal tube will be pushed into the nose and through the thin bone of the maxilla into the sinus. Salty water will be flushed through the tube into the sinus. The salty water will come out of the little drain hole in the sinus, and drain into the nose. Any pus or infected fluid will come out as well. A specimen of the infected fluid will be taken so that it can be examined so that the bugs causing the infection can be identified and then the rest washed away. The metal tube will then be taken out. The inside of the nose usually heals very quickly. There is no need for any stitches. If the little hole in the sinus is blocked by infection, or if the infection is very bad, the surgeon will make a bigger hole into the sinus to help drain the infection away. Because you are asleep, you will not feel any pain at all during the operation. Your operation can be done as a day case. This means that you come into hospital on the day of your operation, and go home the same day. If you leave things as they are, you will get more and more sinus trouble. The infection can damage the lining of the sinuses so that they never get back to normal. Rarely, very serious infections can happen. More antibiotics, sprays, and other drugs will not help at this stage. Sometimes there is another cause for the sinus trouble. It is necessary to find out about this. In your case, the operation is the best way forward. Stop smoking and get your weight down if you are overweight. (See Healthy Living). If you know that you have problems with your blood pressure, your heart, or your lungs, ask your family doctor to check that these are under control. Check the hospital's advice about taking the Pill or hormone replacement therapy (HRT). Check you have a relative or friend who can come with you to the hospital, take you home, and look after you for the first day after the operation. Sort out any tablets, medicines, inhalers that you are using. Keep them in their original boxes and packets. Bring them to the hospital with you. On the ward, you may be checked for past illnesses and may have special tests to make sure that you are well prepared and that you can have the operation as safely as possible. Please tell the doctors and nurses of any allergies to tablets, medicines or dressings. You will have the operation explained to you and will be asked to fill in an operation consent form. Many hospitals now run special preadmission clinics, where you visit for an hour or two, a few weeks or so before the operation for these checks. If you have a cold in the week before your admission to hospital, please telephone the ward and let the ward sister know. The operation will usually be put off, and you will be given time to get better before being sent for again. You will need to get over the cold before the operation can be done because by having an anaesthetic the cold could turn into a serious infection in the chest. You may be given oxygen from a face mask for a few hours if you have had any chest problems in the past. Your nose may feel a little sore after the operation. Painkilling tablets should easily control this discomfort. Ask for more if the pain is not well controlled or if it gets worse. After three to four hours on the ward you should feel fit enough to go home. Before you leave, the nurses will check that your nose is comfortable and is not bleeding. If you have been given antibiotics, you will be told how often to take the tablets, and how many days you will need to use them for. If you have been given nasal drops, you will be told how to use the drops, and for how long. A general anaesthetic may make you slow, clumsy and forgetful for about 24 hours. The nurses will help you with everything you need until you are able to do things for yourself. Do not make important decisions, drive a car, use machinery, or even boil a kettle during this time. If the surgeon needs to see you again and check on your progress, the nurse will give you an appointment for the ENT (ear, nose, and throat) outpatient clinic. The nurses will advise about sick notes, certificates etc. Make sure you are going home by car or taxi, with your relative or friend. You must not drive yourself home. At home, take two painkilling tablets every six hours to control any pain or discomfort. If you are to use antibiotics or nasal drops, follow the instructions you have been given on the ward very carefully. Do not blow your nose for the first 48 hours after the operation. Take it easy for the rest of the day. Do not do anything too energetic in case this starts the nose bleeding. You will be fit to go back to work one or two days after your operation. You will be fit to drive 24 hours after your operation. You should not swim until the lining of the sinus is fully healed. This will take two months or so. Avoid diving for three months. Flying in an ordinary passenger aircraft should be all right after a month. Ask the surgeon if you wish to fly in an unpressurised aircraft. As with any operation under general anaesthetic, there is a very small risk of complications related to your heart and the lungs. The tests that you will have before the operation will make sure that you can have the operation in the safest possible way and will bring the risk for such complications very close to zero. If you follow the advice given above, you are unlikely to have any problems. There is a small risk that the nose may bleed when you get home. If this is just a spot or two you should not worry. If the nose continues to bleed for more than an hour, come back to the ward. There is a small risk of infection at the area of the operation. If you develop increasing pain in the cheek bone or the nose, a headache or a temperature, it probably means that an infection is developing and you will need medical attention promptly. Taking antibiotics for a week or two usually solves the problem.